I thought about the possibility of a “light” intervention project on Stortorget. I started from painting the surface of the square with figures of animals, as happens in Natzca, Peru. Hence my idea of ​​three more “domestic” figures: a cat, a snake and a moose. 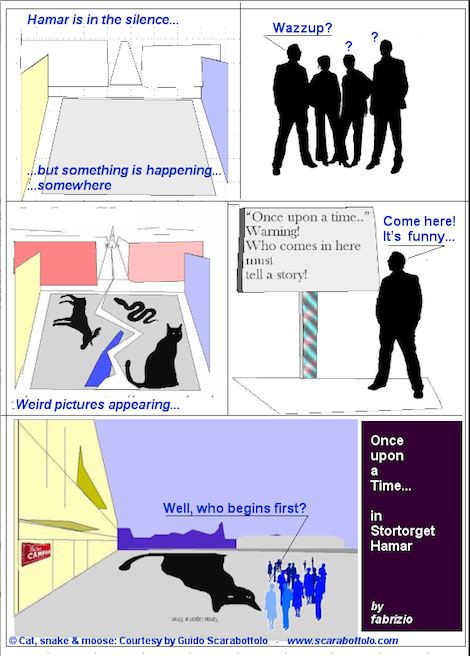 So here is the second idea: make a strip cartoon. The original images “cat” “snake” and “moose” are used by courtesy of graphic designer Guido Scarabottolo. 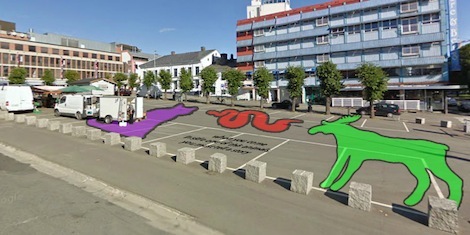 I also thank my colleague Massimo Boffino that have entered the three figures on the google 3D image of the part of the square that is now free from the “KulturHus” building area.